Nowadays it is difficult to miss the theme of climate change. According to reports from climate experts (GIEC), global warming will continue throughout the 21st century at a rate of 0.2°C per decade, mainly driven by anthropogenic emissions of greenhouse gases, further affecting the climate system (Easterling et al., 2000 ; IPCC, 2007). Understanding the impact of global change on the dynamics of animal populations poses a major societal challenge to promote the maintenance of biodiversity (Easterling et al., 2000 ; Clark et al., 2001 ; Hulme, 2005 ; King, 2005 ; Schlesinger, 2006 ; IPCC, 2007). A major challenge for the life sciences is thus the development of models capable of predicting the responses of natural systems to these changes of a key component of their environment (Clark et al., 2001 ; Hulme, 2005 ; Sutherland,2006 ; Jetz et al., 2007). The Alpine climate is highly seasonal and seems particularly sensitive to global change today, but the effect of these recent changes remains poorly evaluated. The increase in average temperature over the last 30 years is likely to change the dynamics of the resources available to herbivores, and also the timing of access to these resources, in particular through the reduction of snow cover in winter and its accelerated melting in the spring. 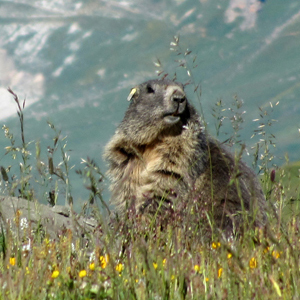 This project is thus concerned with assessing the links between physical processes (climate) and demographic mechanisms to understand the constraints exerted on the populations of Alpine mammals (mainly the Alpine marmot) at the local level. This understanding of the mechanisms can then predict the impact of climate change on these populations, and link the response of species (to climate change) to their life history strategy. Tafani, M. (2013) Effet des changements climatiques sur une population de marmottes alpines (Marmota marmota). 36ème colloque de mammalogie, Toulouse, France. Oral communication. Invited. Tafani, M. (2010) Growth pattern and senescence in body mass of a medium sized herbivore (Marmota marmota). Ecologie 2010 Conference, Montpellier, France. Poster.